Coming up with regular social media content for Twitter, Facebook and/or your blog is crucial. This drum beat keeps your accounts ticking over. But what if you’re sapped of inspiration? 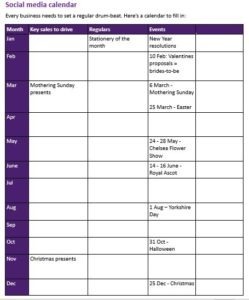 You need some social media calendar ideas. I write social media strategies for clients. Or ‘recipes’ for those who would run screaming from such an official-sounding word. A key part of this is coming up with social media calendar ideas. Things look less daunting when there’s a hook to hang a blog post off, share on Facebook, feature a photo of on Instagram or retweet on Twitter. 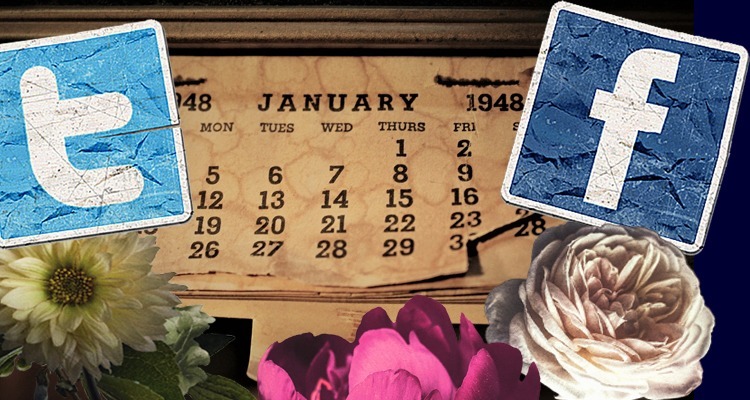 Here are all the traditional dates, plus a few curve balls to get you thinking. 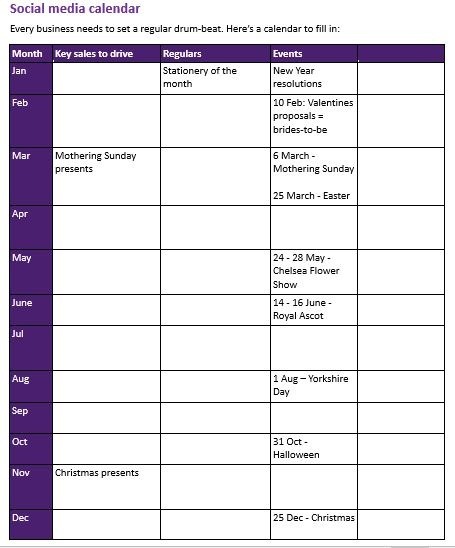 You can also download a cut-down version in Ink Gardener social media calendar 2019 (PDF) which fits on one side of A4. after: with New Year proposals quite a few 👸-to-be, eager to plan their weddings, will have been created. 14 Feb: Valentines Day before: 🎁 🍰 and after: hopefully some keen 👸-to-be who said yes to that romantic proposal. 24 Feb: The Oscars: do any of the key dress colours tie in with your product? Or does a film theme match with what you offer? 1 Mar – St David’s Day: patron saint of Wales. Have you themed a shop window or menu? 1 Apr – April Fool’s Day: social media is supposed to be light-❤ed, so have some fun! 23 Apr – St George’s Day: patron saint of England. Have you themed a shop window or menu? Or given it’s also Shakespeare’s birthday, what about a quote? A happy #WorldPenguinDay, one and all! 21 – 25 May – Chelsea Flower Show: 👸 or if you have a key product colour, you could tie it in with new flowers. Often new varieties have some great names that you could link to. 18 – 22 Jun – Royal Ascot: 👸 for the wedding party. Plus there are usually some great shots of brightly coloured clothes and hats which could tie in with your product. 21 Jun – Summer Solstice – the longest day of the year. 1 – 14 Jul – Wimbledon: Obviously 🏆 but 🍰 have you any strawberry-themed dishes or cocktails? End of Jul – end of term: Could your product be the perfect 🎁 for teacher? 1 Aug – Yorkshire Day: Have you themed a shop window or menu? 31 Oct – Halloween: Have you themed a shop window or menu? 🍰 can you offer a gruesomely-named cocktail for the occasion? 30 Nov – St Andrew’s Day: patron saint of Scotland. Have you themed a shop window or menu? Your own 2018 awards – take stock as to what you’ve achieved or learnt this year. A birthday of someone you admire – like an author or business leader. Why not send your regards via Twitter? What’s your key message or sale to drive that month? If you know sales dip in a certain month, schedule something a couple of weeks beforehand with a special offer. What’s your ideal time period for orders? If you have an online shop, you can tweet up to the day before if you can deliver quickly. But it’s often best to remind people a fortnight before, and then repeat a similar message a week before. Many people are surprised by how long it takes to create a wedding dress or arrange an event. So make sure you give them plenty of notice and some friendly nudges. I love coming up with social media calendar ideas. I can give you one-on-one coaching in an Ink Gardener Greenhouse session. Or I can provide a tailored Social Media Seed Packet. Just get in touch.